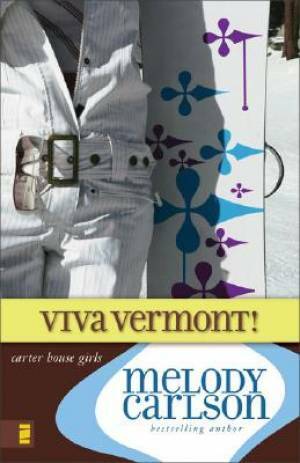 and youve got The Carter House Girls, Melody Carlsons new chick lit series for young adults! Christmas is coming and Mrs. Carter treats the girls to a weekend trip to General Hardings luxurious Vermont ski lodge. Naturally, she has no idea that Taylor has invited some guys to follow themboys who have a different type of adventure in mind. As usual, Mrs. Carter does not pay close attention to the girls activities. When a dinner outing and small accident keep her away overnight, DJ, Eliza, Taylor, Kriti, Rhiannon, and Casey are quickly in over their heads. As a party gets completely out of hand, only Gods help can get the Carter House girls out of this gigantic mess. This is the fourth book in the new series from Melody Carlson, one of the top authors in the young adult market. Her Diary of a Teenage Girl series and the True colours Series are incredibly popular. Viva Vermont! by Melody Carlson was published by Zondervan in September 2008 and is our 21702nd best seller. The ISBN for Viva Vermont! is 9780310714910. Be the first to review Viva Vermont!! Got a question? No problem! Just click here to ask us about Viva Vermont!.